Guss Lambden in Yarragon on Monday. Former Latrobe City Council candidate Guss Lambden has turned his focus to state politics and is standing as an independent candidate for Narracan. The Moe man is a former military combat systems operator, and this background has shaped many of his policies. 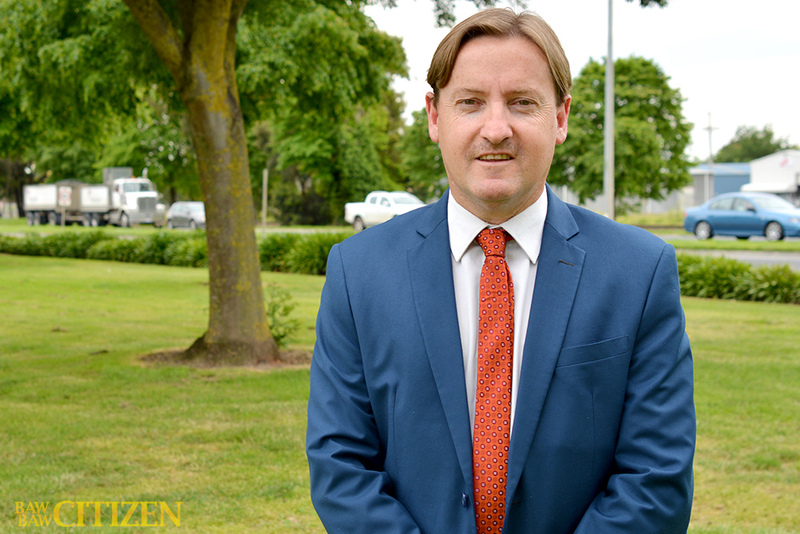 We spoke with Mr Lambden earlier this week and asked what prompted him to stand for parliament. Guss Lambden: I would normally be a Liberal voter myself, having come from a military background, but I guess like a lot of people at the moment I’m really disillusioned with the major parties. I believe we’re neglected at both state and federal level, and you can see what the independents [achieve] at a federal level so I guess we’re trying to replicate that at a state level. Baw Baw Citizen: By we, do you mean this region? GL: Yeah, I generally think the region as a whole has been neglected. I grew up in the area and moved away to join the military, but having been back for the last six years and as a resident and a homeowner myself I see that the place has stagnated and we’re sort of going backwards instead or going forwards. BBC: You said you’re usually a Liberal voter. Were you on that party’s conservative side, or were you more of a ‘wet’? GL: I grew up in a Labor household in Morwell, which is a long-term Labor area. I spent most of my younger years in Morwell. Probably on the military side you tend to have a Liberal leaning because of the way they look after the military, but obviously now I’m taking a different stance completely. I’m very very passionate about being an independent in the election. BBC: What was your military background? GL: I was a combat systems operator, or radar operator. I didn’t actually serve in a conflict zone. I assisted vessels in my employment, travelled overseas, worked a lot with foreign shipping and also prepared other Australian ships to go off to Iraq and Afghanistan. BBC: This isn’t your first time looking to enter politics – you’ve stood for Latrobe City Council in the past. GL: That’s right. I stood as a West ward councillor in 2016. I was unsuccessful, but up against some very very good candidates from the Moe area who were very well known. I learned a lot out of that, and this is obviously a major step up from that. I’ve had good support from the likes of Russell Northe and Tracie Lund (both running as independents for the seat of Morwell) and previous state candidates, as well as Michael Fozard (a local independent upper house candidate) himself. BBC: Politically, do you find you identify with people like Northe? GL: I can definitely relate to both Russell and Tracie, because they’re both very community-minded people and I like to think of myself as community minded as well. Having grown up here and, okay, I did move away for a while, but the heart’s always here. It’s where I’ve grown up and where my family have spent the majority of their life. I’m very passionate about the region. Russell and Tracie are very down to earth and have the best interests of the area at heart. BBC: What are your key issues heading into this election? GL: The key issues really are, without a doubt, the West Gippsland Hospital. They’ve got a green (sic) site ready to build. My thoughts are both Labor and Liberal won’t build the new hospital, and I believe that opens up a massive opportunity for an independent like myself and Carlo to take a lot of votes off Liberal and Labor. GL: No, but even a restructure, however they’re going to do it, it needs to be carefully considered because I think the current model, they’re a very, very important part of our emergency services structure. We get rid of the CFA and come summertime our fire brigades will be under-resourced and way out of their depth. GL: Obviously employment is another key issue. Local jobs for local people I think is a big one. There’s a lot of work being outsourced to interstate workers, overseas people brought in. Okay, where necessary that’s fine, but we need to get the youth of Gippsland and Narracan employed. You get someone gainfully employed with a bit of purpose in their life and that’s where all your social problems will disappear. BBC: Have you actually heard from young people that they’re missing out on these jobs, or are they just jobs young people don’t necessarily want when there’s better work potentially available? GL: I think there probably are cases where we are a bit fussy today. We probably think we are entitled to certain privileges as locals. But you still have to be the best candidate for the job and you have to present yourself well. One of the other issues I’ll mention is that, being an ex-military member, if elected I would push very hard for a military recruitment centre in either Moe or Warragul. I see the military as a viable option for a young man or woman, as something different to tertiary education or a trade certificate. Whichever way you go, it gives another option. BBC: Isn’t it unusual for country towns like Warragul and Moe to have recruitment centres? Doesn’t this usually happen in Melbourne? GL: Yeah, it generally happens in the city. There has been a centre in Sale and some regional centres do have a recruitment agency set up. I think it’s something we could handle in Narracan. BBC: You listed a few issues – things like improving public transport. Do you know how you would improve those connections? GL: We’ve all been on trains that have been delayed and spent hours extra on trains than we think we should. I’d obviously be an advocate for change, but I’m sure we’d put in place some sort of plan with advice from the people on what they’re looking for. BBC: You’re saying ‘okay, we’ll look for ways to improve it,’ which is basically what the two major parties have been saying. How is what you’re saying different? GL: It’s a tough one, it’s not an easy option. We may have to go to a separate line if that’s a viable option. I understand it all comes down to dollars and cents and it’s what’s affordable. This is something that’s been in the pipeline for 20+ years, it’s well overdue.